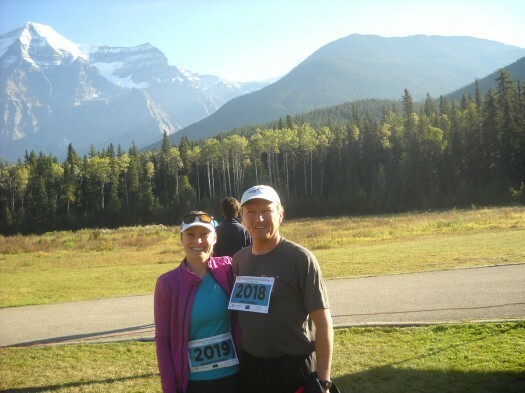 The Mount Robson Marathon will is an “out-and-back” run on the world famous Berg Lake Trail. This year’s marathon will take place on Saturday September 7, 2013.There is a full marathon and a half marathon option. The route passes through several different environmental zones and has its turn-around point on the shores of magnificent Berg Lake, truly making this marathon a one of a kind experience. The route is actually 46 km, or about 4 km longer than a “true” marathon. On the route, you will experience an elevation gain of 825 m (2,700 ft) from the base to the turn-around point. For non-endurance runners, enjoy a 12km run to Kinney Lake and back. Children aged 5-12 can participate in 3/4 km and 1.5 km fun-runs around the nature trail near the Visitor Centre. You can register for the marathon online; entry fees range from $25 to $45. Possibly the best scenery of any marathon! In addition to the races, other activities will take place in and around the Visitor Centre throughout the day. The trail begins in a temperate rain forest. Giant western red cedars create a magnificent canopy of old growth forest. It is an easy route through the forest to Kinney lake. Travel is relatively easy across the valley and up some moderate switch backs. It is not until passing the Whitehorn campground that the trail becomes more challenging. From here a large headwall is ascended through the valley of a thousand falls. The trail is well maintained and the views during the ascent are very impressive, especially in late June or after a rain storm. From the top of the headwall the trail follows the shoreline of Berg lake. Travel is again moderate and the magnificent view of Mt. Robson’s north face comes into view. The Berg Lake Trail is literally located minutes from the Mountain River Lodge. 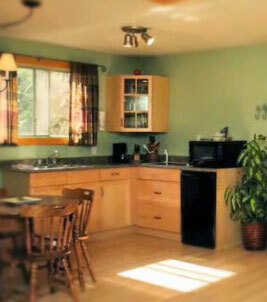 We have both independent cabins and a bed and breakfast. Did you know Canada had its fair share of cowboys? That legacy lives on here, just as it does in the States, with the rodeo. An event showcasing the kind of horseback skills that were essential during the cattle drives of yore, this Rodeo is no different. Enjoy all of the traditional rodeo events plus a live country music band, dancing and steak dinner. The Canoe Mountain Rodeo takes place this year on July 13 & 14. Located in Valemount at the Canoe River Campground Rodeo Grounds, it is only 20 minutes from our Mount Robson cabins and lodge. The rodeo will run from 11 a.m. to 5 p.m. on Saturday and Sunday, with the steak dinner on Saturday night from 5 – 7 p.m., followed by dancing to the “Union Jack” band starting at 9 p.m. Admission for each day’s events is $15, children 12 and under are free. Admission to the dance is $10. The interior of one of our self-contained cabins. Throughout the day, enjoy a beer garden and concessions, along with other vendors. For the kids, there is a sprinkler play space to keep ’em cool, as well as a ‘Treasure Mountain’ play area. Traveling in British Columbia this Summer? Do not miss the beauty and natural wonder of Mount Robson Park and Jasper National Park. Along with seeing some of the most spectacular peaks in the Canadian Rockies, you can soak in the quiet charm of the rural life we live in this area of the country. Take a hike on the Berg Lake Trail and enjoy a home cooked meal in our lodge or prepare your own steak dinner in one of our self-contained cabins. If you’re looking for a family friendly vacation in the Canadian Rockies, then Mountain River Lodge near Jasper National Park has everything you need. We have just the right accommodations, services and location to all the great outdoor adventures offered by Mount Robson and Jasper National Park. The Main Lodge bed and breakfast currently has four guest rooms (the fifth is soon to be finished!) All rooms have beautiful views and private baths. Conveniently, all rooms are on the same level so you don’t have to worry about the kids being on another floor and too far away. Your stay comes with a full breakfast served in the guest lounge with a spectacular view of Mount Robson and the Fraser River. 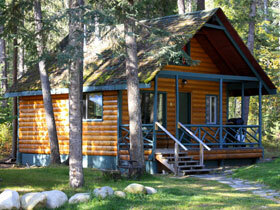 Our charming Mount Robson cabins are also perfect for families. Both of our cabins, Cedar Point Cabin and Riverside Cabin, have fully equipped kitchens, dining areas, TVs with satellite and a gas grill for family cookouts. The Riverside Cabin also features an outdoor deck with outstanding mountain and river views. Light housekeeping is provided daily so you can have the vacation feeling that comes from not having to clean up all the time like you do at home. Our pet-friendly lodging in our cabins also mean you don’t have to leave your dog at home! Valemount is only minutes away so you can stock up on supplies and use any services you might need there. If you don’t want to cook, we also provide suppers. (Again, it’s one of those details to give you that lovely vacation feeling!) Just call ahead for your reservations. A family hiking trip is just outside your door… the famous Berg Lake Trail is just minute from our lodging near Mount Robson. Other family friendly Jasper National Park area activities include the fun wildlife safari, horseback riding and whitewater rafting. Just ask and we’ll be happy to fill you in on the details and help you plan your excursion. If a family camping trip is also on your agenda, Berg Lake Trail also features a number of camp sites which can be booked at the nearby Mount Robson Visitor Centre. You can have a fun camping experience, but then come back to the Lodge or a cabin for a comfortable transition–showers, a kitchen, and a nice warm bed–before going back home, refreshed and renewed. You and your family will never forget the fun and wonders of Jasper National Park, Berg Lake Trail and all the other outdoor adventures of our corner of the Canadian Rockies. Inquire about booking your rooms or cabin for your family vacation at Mount Robson today!